PURALGA has developed a revolutionary system in order to obtain high value products from environmental wastes like the CO2 and water with nitrate and phosphates. The system works based on a mixed cultivation of bacteria and micro-seaweed that result highly efficient, thanks to the synergy that is generated between them. The proposed system is doubly innovating. Through an unique cultivation medium, the seaweed and the bacteria, working jointly, allows the system to be considerate as compacted and energetically more efficient. The effectiveness is reached by the incrementation of the synthesis of the bio-product respect to other similar processes from 3 to 4 times. (12g/lts. per day of biomass). In other hand, this resolves the problema of collecting the micro-seaweed in the medium. 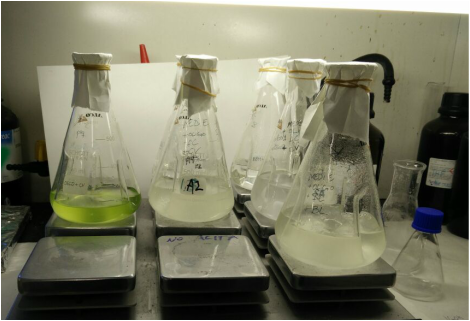 Thanks to the flocculant properties of the product that segregates the bacterium, the micro seaweed can be agglutinated and can also be reached more easily (reduction of more than a 20% of the picking costs). 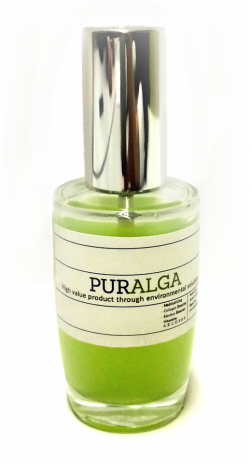 The cosmetic market offers an excellent opportunity for PURALGA. In first place, the biopolymer produced is approved as raw material for cosmetics considering some requirements of the product’s final quality. Also, the use of this product in the cosmetic market has an elevated potential of growth thanks to its capacity for retaining humidity and also for being an edible product that has non-toxic properties and can be easily synthesised. At last but not least, it is important to notice that all of the effort that PURALGA is dedicating for research and investigation of this polymer is going to be used as know-how in order to improve the technology of the company. Also, this will permit a development of a new product through the combination of this biopolymer and seaweed biomass that will be capable of stimulate the collagen and elastine synthesis on the skin, as well providing all the vitamins: A, B, C, D, E & K.
The biopolymer obtained through the PURALGA process is natural and biodegradable and it is the best choice as base material for the fabrication of hydrogels that can be used in biomedicine, cosmetics and environmental applications. The biopolymer-based hydrogels demonstrate an excellent ability for the water absorption that is about 5000 times of its own weight and also, at the same time, they are non-toxics and eco-friendly. So, they can be used as an excellent choice for the seed covering, the control of animal feces waste, for water treatment and hygiene products. 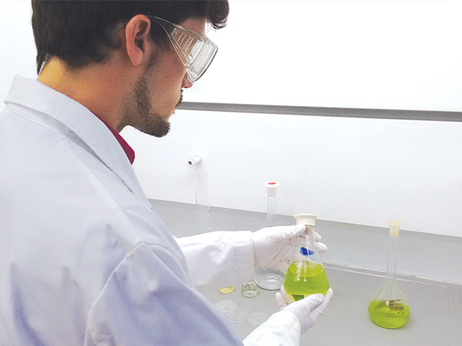 The covering of the seaweed biomass obtained in the PURALGA system through the hydrogel would allow the creation of a new cosmetic product with excellent properties. On one hand, the hydrogel contributes with great water absorption capacity and; in other hand, the seaweed biomass boosts the collagen and elastine synthesis on the skin and provides A, B, C, D, E and K vitamins. This hydrogel is a brand-new product, so for now its reception into the market is still unknown. As a future matter, the hydrogel properties have to be taken into consideration because it could cause a positive and a very expansive impact into the market. The use of the biopolymer as the base for creating hydrating creams involves numerous advantages regarding the use of hyaluronic acid.The principal advantage is that the production cost can be 5 times less than the production cost of the hyaluronic acid. The product developed by PURALGA is synthesised by means of wastes like the CO2 or water with an elevate content of phosphates and nitrates. This has a positive impact in order to decrease the energetic costs and the use raw material into the industry. And also, allows that a high quality product could be introduced in similar markets as the ones of the hyaluronic acid, but at a low cost fare. Nowadays, in Europe the consumers are more and more concerned about the health, the quality of the products that they use and also their impact on the environment. So they want to find and need to use products with certifications that can guarantee the presences of only natural ingredientes and organic raw materials that can replace the synthetic ingredients. Then, the PURALGA polymer is the best choice into this field: A biosynthetic product with high quality that is produced under the Europe laws and quality standards.